Darla Miles has more from Grand Central Terminal. 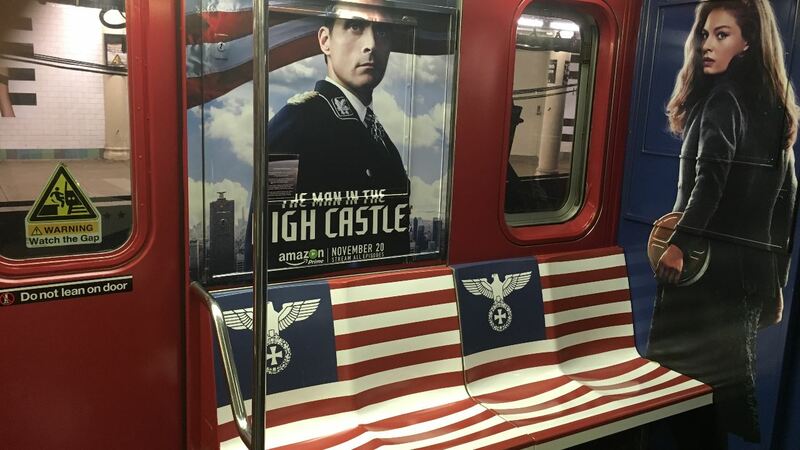 TIMES SQUARE, Manhattan -- Amazon has pulled a controversial ad campaign that showed a Nazi-like insignia on a New York City subway train that had riders crying foul, and even had the mayor speaking out against. Sources told Eyewitness News the campaign was pulled Tuesday. 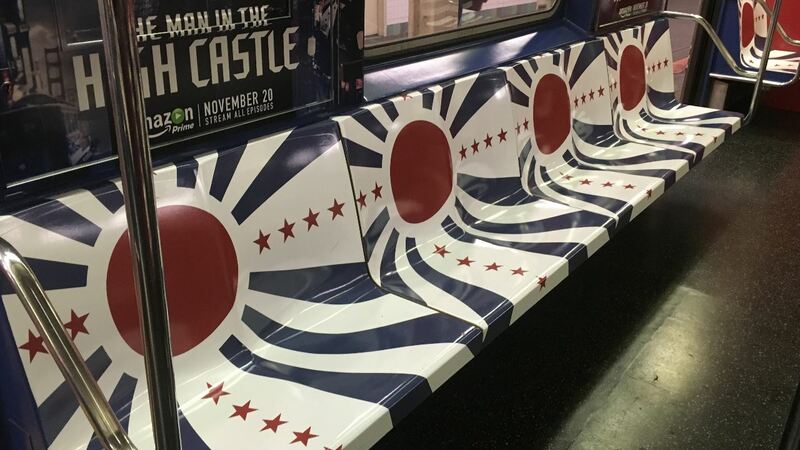 It was an advertisement for Amazon's streaming show, "The Man in the High Castle." The show's premise is to show what America would look like if it lost World War II. The MTA said the campaign was scheduled to run from Nov. 15 to Dec. 14 as a "wrapper" on the Shuttle between Times Square and Grand Central. It was within the ad rules MTA has in place. The wrapper ad isn't just a normal subway ad - it's the entire subway car immersed in the ad. "The ads do not violate our content-neutral ad standards and thus we have no grounds to reject them," said the MTA in a statement. "The MTA is a government agency and can't accept or reject ads based on how we feel about them; we have to follow the standards approved by our board." Once the ad was posted in the train, riders noticed it and started posting to social media about it. And then Mayor Bill de Blasio got wind of it. He released a statement on Tuesday. "While these ads technically may be within MTA guidelines, they're irresponsible and offensive to World War II and Holocaust survivors, their families, and countless other New Yorkers. Amazon should take them down," de Blasio said. The Anti-Defamation League said the biggest issue it has with the ad campaign is that it came without any context. On the television program, which explains this is the notion of an America controlled by Hitler, you get that context. On the train, seeing the American flag paired with a Nazi symbol is viscerally offensive, because there is no context as to what it means," said Evan Bernstein, the New York regional director for the Anti-Defamation League." 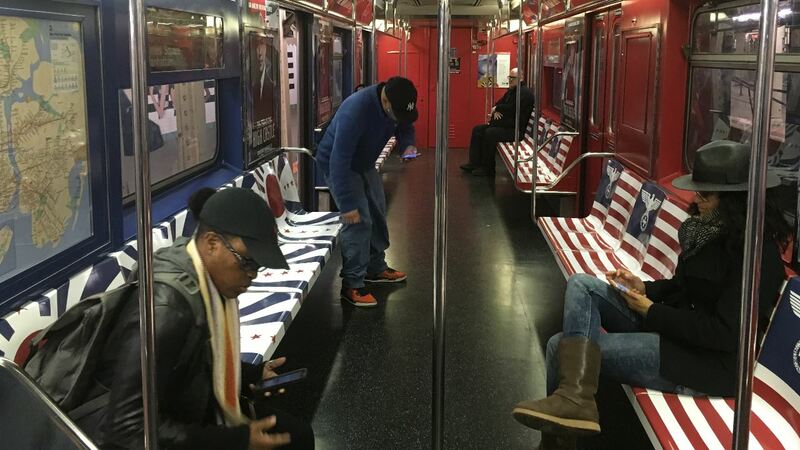 The fact that the flag is spread across the seats only compounds the effect." The ads were pulled very quickly. Our crew didn't see the ad on the train as of early Tuesday afternoon. What do you think about the ad? Chime in via the comment section below.